Ken Saro-Wiwa was a man of many faces. He was a businessman, a novelist, a television producer and most importantly an activist that paid for his life for protecting his Ogoni people in Ogoni land. 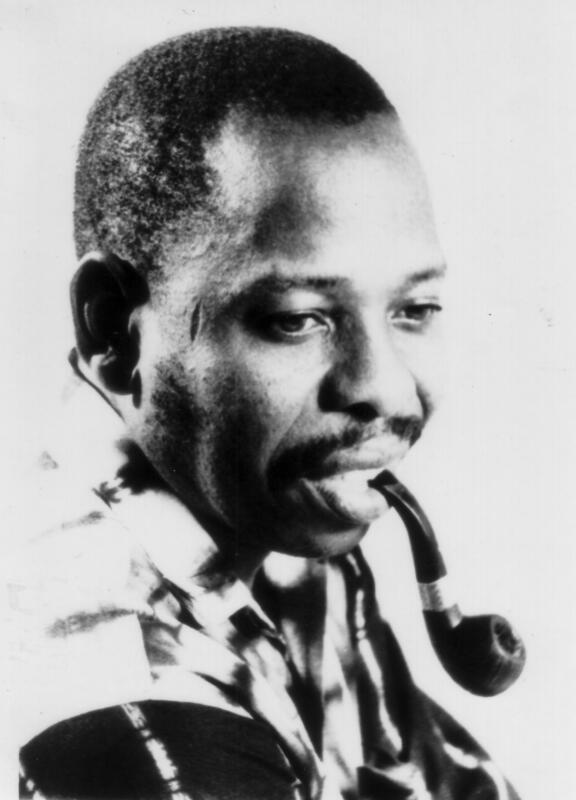 Ken Saro-Wiwa was born on 10 th October 1941 and died on 10th November 1995. He was a Nigerian writer, television producer, environmental activist, and winner of the Right Livelihood Award as well as the Goldman Environmental Prize. 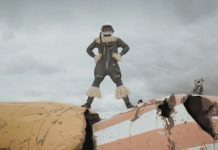 Saro-Wiwa was a member of the Ogoni people, an ethnic minority in Nigeria whose homeland, Ogoniland, in the Niger Delta has been targeted for crude oil extraction since the 1950s and has continued to suffer extreme environmental damage. Shell started producing oil in the Delta in 1958. 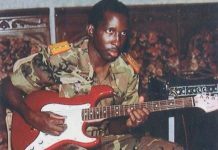 In 1970, the first seeds of the current conflict were sown when Ogoni Chiefs handed a petition to the local Military Governor complaining about Shell. 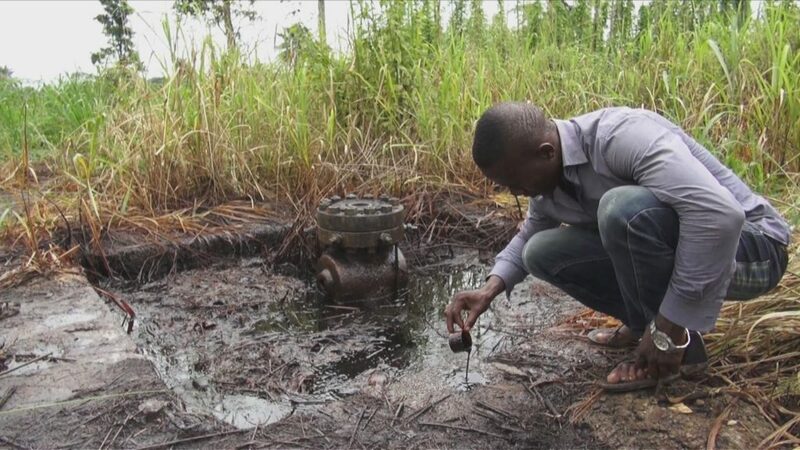 According to the petition, the company was “seriously threatening the well-being, and even the very lives” of the Ogoni because of the widespread pollution. In 1990, Saro-Wiwa began devoting most of his time to human rights and environmental causes, particularly in Ogoniland. He was one of the earliest members of the Movement for the Survival of the Ogoni People (MOSOP), which advocated for the rights of the Ogoni people. 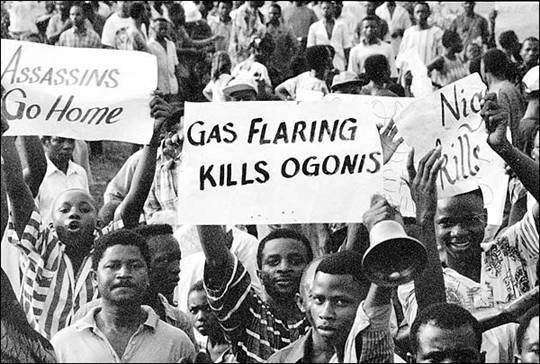 The Ogoni Bill of Rights, written by MOSOP, set out the movement&#39;s demands, including increased autonomy for the Ogoni people, a fair share of the proceeds of oil extraction, and remediation of environmental damage to Ogoni lands. In particular, MOSOP struggled against the degradation of Ogoni lands by the Shell oil company. A local in Ogoni land showing crude oil that is floating in ponds amidst the maize and cassava fields. In 1993, MOSOP organized demonstrations of around 300,000 Ogoni people more than half of the Ogoni population, drawing international attention to his people&#39;s plight. This led to Saro-Wiwa’s arrest by Nigerian authorities but was released after a month. In May 1994, four Ogoni chiefs were brutally murdered. Saro-Wiwa had been denied entry to Ogoniland on the day of the murders, but he was arrested and accused of incitement. 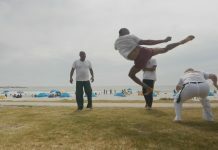 He denied the charges but was imprisoned for over a year before being found guilty and sentenced to death. “What sort of country is this that delights in the killing of industrious citizens. What have I done to deserve death only that I spoke the truth, if it be by my death people can be free, Lord allow me to die,” Alfred Ilere a member of MOSOP recalled what he heard from Saro-Wiwa. The same happened to other MOSOP leaders. Ogoni people demonstrating against oil companies. Eventually, Shell oil company discontinued it’s million-dollar operation in Ogoni land. Wiwa, daughter of Ken Saro-Wiwa said. They were buried in Port Harcourt Cemetery. “I never imagined even after 20 years, my father’s death would be so painful as if it happened yesterday,” Ken Wiwa, son of Ken Saro-Wiwa lamented. series, Basi and Company which was purported to be the most watched soap opera in Africa. Ken Saro-Wiwa also had a wife called Maria and five children. To most people, Ken Saro-Wiwa was a Nigerian activist and a martyr, a brave and inspiring campaigner who led his Ogoni people’s struggle against the decades-long defilement of their land but unfortunately ended up paying for it with his life. Although Saro-Wiwa is dead, the triumph of the human fight against evil in all its ugly faces; social injustice, environmental devastation, greed, selfishness, human rights abuse and denigration of the people is slowly being achieved. The struggle still goes on and the legacy of Ken Saro-Wiwa lives on.